Add additional handsets to previously purchased PowerTel products to provide even more freedom within your home. 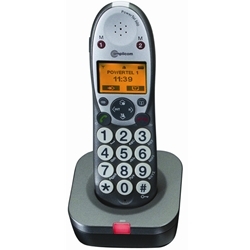 The PowerTel 501 provides up to 50dB of amplification through its easy-to-handle, big button handset and since it communicates with the base of your existing PowerTel product, there is no phone jack connection required. With superior hearing aid compatibility that meets and exceeds the TIA-1083 standard and crystal clear DECT 6.0 technology, the 501 produces excellent sound with more than 80% reduction of distortion. Amplicom’s PowerTel are the only amplified telephones that offer yourSOUND, pre-programmed, multiple user profile buttons that memorize volume and tone control for more than one user.